A life vest or, as a cheaper substitute, the inflated inner-tube of a tire are among the few items that migrants carry these days when they arrive on the shores of southern Spain. Shoes, clothes and cash are often lost along the journey. Identity documents and, increasingly, cellphones make the trip. Wrapped in plastic to resist the salt waters of the Strait of Gibraltar, the cellphones are crucial links to humanitarian groups and maritime authorities, so those crossing the dangerous waters can send their locations for rescues. Once ashore, the soaked but power-drained batteries are laid on the ground to absorb the warmth of the sun, which many believe will give the phones a few seconds of extra life to contact their relatives. Emergency makeshift relief centers now dot Spain’s southern coast, testament to a surge in arrivals by sea as Italy’s clampdown sends migrants further westward. Far-right, nationalist and populist politicians have gained ground in both Rome and Berlin, prompting the European Union to re-examine its migration policies. Last week EU leaders struck a deal on migration that most human rights organizations and activists call insufficient. 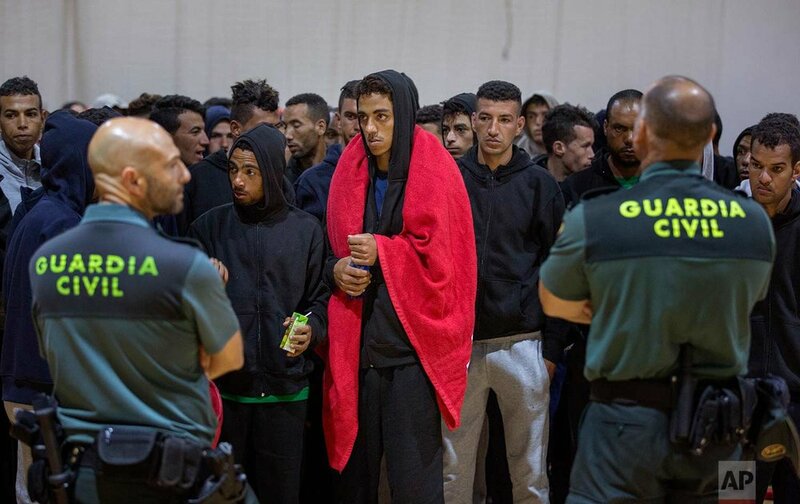 In Spain, meanwhile, about 15,000 migrants have already entered this year via the short but treacherous trip across the strait, the International Organization for Migration says. The trip is less than 9 miles (14 kilometers) from Morocco to Spain’s southern beach town of Tarifa. Over 2,700 more migrants crossed into Spain by land in its North African enclaves of Ceuta and Melilla. Disoriented and exhausted, groups of mostly men and teenagers, with some women with newborns, debark from the rescue boats. They shiver from the cold journey but are mostly grateful for the rescuers. While most sub-Saharan migrants hope to be picked up by Spanish rescuers as soon as they leave Morocco’s territorial waters, some try desperately to get all the way to an Andalusian beach in order to evade near-certain deportation. As Associated Press journalists found out last week during a trip to document the uptick in Mediterranean Sea arrivals, that situation causes tensions between rescuers and migrants. Often, migrants refuse help or jump out from rescue vessels as they enter the Spanish ports of Tarifa, Barbate or Algeciras. To avoid clashes, civil guard officials have begun sailing alongside rescuers. Last Friday, an Italian coast guard ship operated by Frontex, the European border agency, escorted a Spanish rescue boat to the entrance to Tarifa’s port. On arrival, its Moroccan passengers — including women and children — were seen bound to each other by their wrists. The situation has also prompted a surge of rubber boats carrying exclusively Moroccan teenagers who, as underage unaccompanied migrants, are allowed to remain under the care of authorities until they can reunite with relatives already living in Europe. On June 29, a group of 34 of them arrived in a secluded beach near Tarifa. They were jubilant, cold and hungry when police, Red Cross volunteers and journalists found them near an old lighthouse. Their boat lay deflated on the sand, at the mercy of the surging tide. Text from story AP story, AP PHOTOS: Cellphones, teenagers on migrant route to Europe, by Aritz Parra.